Saint Tirugnana Sambandar and Sundarar had sung the glory of the Lord of the temple in their Thevaram hymns. 10 day Vaikasi visagam in May-June and 6 day Sashti are the festivals celebrated for Lord Amirthakada Subramanya. Navagrahas the nine planets are on a straight line in this temple. 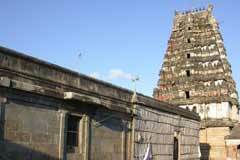 The temple is open from 9.00 a.m. to 10.00 a.m. and fro 5.00 p.m. to 6.00 p.m.
Sri Kodi Kuzhagar Koil-Amudha Kadeswarar Koil, Kodiakadu-614 821, Nagapattinam district. 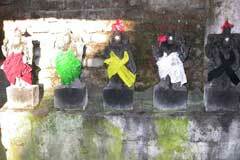 Lord Brahmma, Lord Ganapathi, Lingodhbava and Mother Durga bless the devotees from the goshta wall. People pray to Lord for wedding, child boon and for excellence in education. While churning the milk ocean for the Nectar, the demons created a wild hurricane. God of Wind Vayu Bhagwan controlled the tempest. 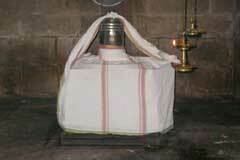 When the Nectar spilled, Lord Subramania (Muruga) held it in a Kalasa-vessel. He appears in this temple with the Nectar-Kalasa. People pray to him for longevity. 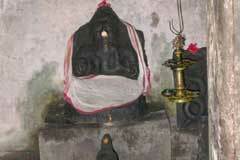 Though a Lord Shiva temple, all prominence goes to Lord Muruga. 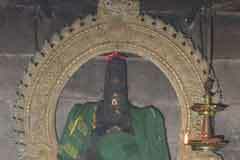 Saint Arunagiriar had sung the glory of Lord Muruga of this temple in his celebrated Tirupugazh hymns. 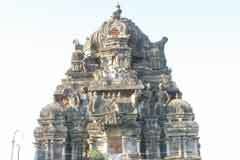 This is a very ancient temple. Mother Maiyar Thadanganni appears all merciful. 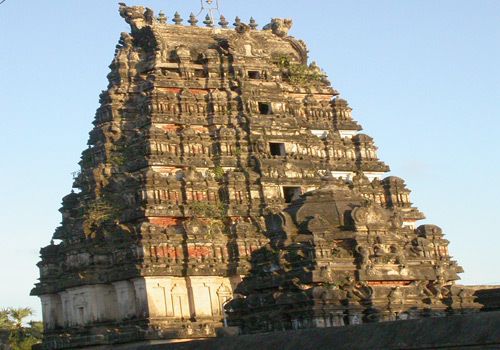 The one different feature of the temple is that the Navagrahas in the temple are on a straight line witnessing the wedding posture of Lord Shiva with Mother. 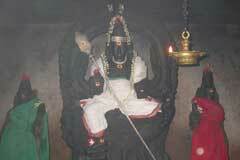 Kodiakadu being a jungle area, there is a jungle custodian deity praised as Sookadu Kizhal. The sea route to Lanka is short from this place. Sugriva planned to build a bridge from here to Lanka to help Rama to cross the sea. But Lord Sri Rama disagreed with the proposal as Kodiakadu is behind Lanka and that would not be right or graceful to attack Ravana from behind and proceeded to Dhanushkodi being opposite to the front entrance of the island. 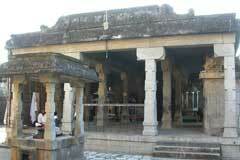 He worshipped Lord Shiva here before proceeding to Lanka. Remembering this event, the foot prints of Rama is carved here. 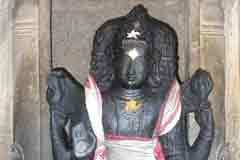 Lord Shiva in the temple is also praised as Amirtha Kadeswarar. Miracle Based: Navagrahas in the temple are on a straight line against the traditional pattern of being in a circular form facing different directions. Kodiakadu is 9 km far from Vedaranyam on the Kodiakarai route. Vehicles are checked by police for security reasons and allowed to proceed after noting the vehicle registration number. Bus facility is also available.